College of Business Informatics Organized a Definitional Seminar about the offered U.S.A scholarship to the Iraq. 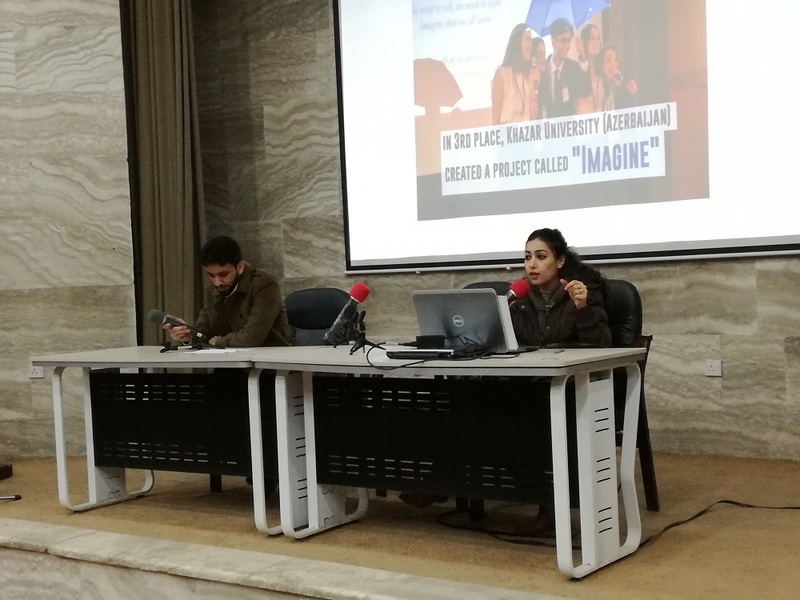 College of Business Informatics in UOITC organized a seminar for explaining the scholarship was offered by American embassy to the Iraq and it is called "Peer to Peer-Challenging Extremism". The aim of this scholarship is to build a young leader does not tune out of the sectarianism, racism and hatred. This scholarship is supported by many international companies including; Facebook, EVP (EdVenture Partners) and other supporting companies. The seminar was introduced by the assistants lecturers "Alaa Hamza and Yasir Al-Asadi", whereas the main points and the goals of this scholarship were discussed in detail and the images of the winners from different countries who participated in the previous courses were displayed front of the attended students. A specialized committee was constituted for tracking and registering the interested students in the introducing to this scholarship and also the projects and thoughts that are introduced by each of them, noting that this scholarship specified for the students of Business Informatics college in UOITC as it is specialized University in the field of informatics and programmatic systems. The committee headed by the daen of Business Informatics College "Dr. Safaa O. Mahdi" while the members were: "Dr. Alaa A. Abod" head of the department of Business Informatics Technology, "Dr. Intisar S. Gleb" head of the department of Systems Informatics Administration and finally the assistants lecturers "Alaa Hamza and Yasir Al-Asadi".